Some days you find things that are so wondrous that you have to share them. I give you: Aerobics Cat, a delightful gif of a cat doing aerobic exercises. I am also going to share a recipe for low carb roasted cauliflower Alfredo sauce, to go along with the feline cuteness. To made this cauliflower Alfredo sauce, you start with a head of cauliflower and a handful of garlic cloves. You roast them at a very high heat until they are tender and fragrant. Then you blend them with almond milk, cream, parmesan, cream cheese and browned butter. This recipe is based on a great recipe for Roasted Cauliflower Fettuccine Alfredo that I found on Cooking Classy. It’s like similar recipes that use steamed cauliflower, but roasting the vegetables gives them a richer, more flavorful taste. This sauce is a little bit chunkier though, so if you want a smoother sauce, you should steam the cauliflower. Either way, it’s tasty as all get out. Ok, well that just about does it for me. Let’s see that adorable Aerobics Cat one more time. Who knew you could make a low carb Alfredo sauce out of cauliflower? It’s a creamy sauce with only 3g net carbs. 1. Preheat oven to 425 degrees F and get out a large cookie sheet. 2. Add cauliflower to a medium sized bowl. Drizzle with olive oil and mix well to coat. 3. Add to cookie sheet along with the unpeeled garlic cloves and roast for 25-30 minutes until browned and tender. 4. Add cauliflower, peeled garlic cloves, almond milk and cream to a food processor or high powered blender. Process until well pureed. 5. Add butter to a large sauce pan or soup pot. Cook over medium heat until browned, stirring constantly. Remove from heat and add in cauliflower puree, cream cheese, parmesan cheese, salt and pepper. Return to Low heat and stir until the cheeses are melted and combined. Add extra almond milk in 1 tablespoon measures until sauce is the desired consistency. Taste test for saltiness and add more salt and pepper if desired. 6. 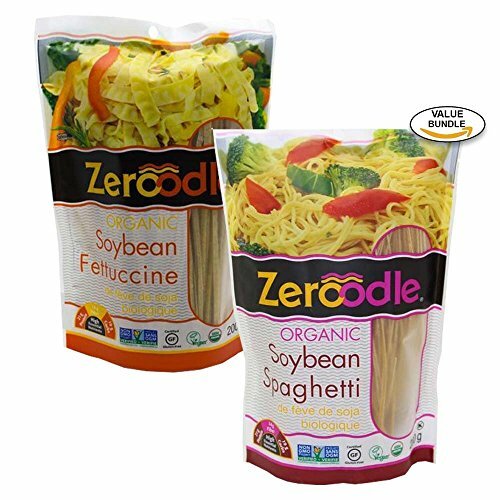 Serve with low carb noodles like shirataki, soy or kelp noodles, zoodles or use the sauce over chicken or fish. 7. Sprinkle parsley and parmesan cheese on top to garnish. If you liked this low carb pasta recipe, then you might like my recipes for Pesto with Edamame Noodles, Fettuccine with Cream Mushroom Sauce or Pappardelle Bolognese. I was a little bit leary of the cauliflower but it turned out good. Great recipe. Yea, you really don’t taste it with all the heavy cream.